Tacamo respects your love for the Tippmann® A-5®…and your desire to try out the hot new magazine-only game formats, like at “Operation: End War,” and an increasing number of events across the country. When you want to get that hopper out of your way, open up your field of vision, improve the balance and natural point of aim of your marker, and get rocking with a true mil-sim piece that not only looks but also reloads and points the same as the real thing, you need the Tacamo Magazine Conversion Kit. 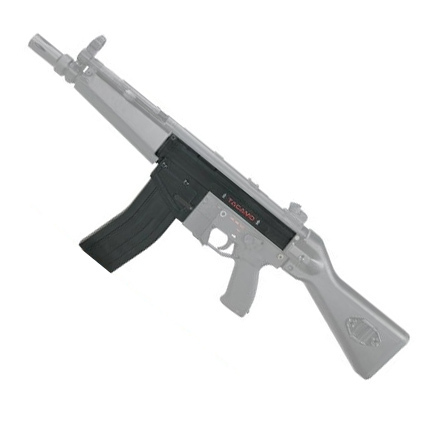 It works with the Tippmann® A-5® you already own—that’s the beauty of this revolutionary aftermarket accessory. Disassemble your Tippmann® A-5®, and follow the included instructions to transfer the internal parts to the Tacamo Magazine Conversion Kit. After assembly, you’ll have a marker that retains the heart and soul of the Tippmann® A-5® you know and love, but accepts detachable magazines instead of ugly, noisy, bulky hoppers. Then you can rock 20 rounds at a time, making every shot count like a pump player…but relying on the semi-auto firepower of your trusted marker, and the spring-fed reliability (a ball in the chamber every time—no matter the rate of fire, or angle of the marker) of the RAP4 magazine. Tacamo’s engineers have been working on this kit for a long time, getting the compatibility perfect…and then focusing on the aesthetics outside. The Tacamo A-5® Magazine Conversion Kit retains the aesthetic, helping you achieve the look military arm. The Magazine Conversion Kit even takes your standard trigger group, or the aftermarket electronic trigger groups for a real firepower increase! If you want the advantages and aesthetics of a magazine fed marker, but without sacrificing the onboard paint capacity of a hopper, pick up a RAP4 Box Magazine and put 250 balls onboard your marker. When you’re serious about woodsball, mil-sim, looking authentic or just having fun, you need to take your Tippmann® A-5® to the next level with Tacamo! - Takes you to a whole new level of tactical paintball!